I think there are two major classifications of spikes – let’s call them simply “good” and “bad” so you know how you’re supposed to feel about them. 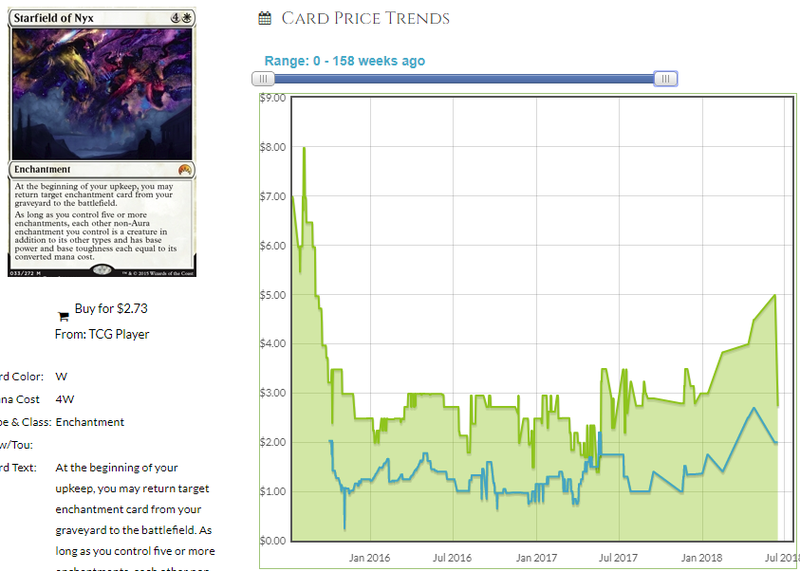 A “bad” spike is one that feels forced – it’s a bunch of dudes on Reddit all getting together to buy Catacomb Dragon because it’s on the Reserved List. The justification for it is always ex post facto as if they thought about how to make the case for it after they bought it. You’ll notice them calling it an “EDH staple” and if you mention EDHREC, there’s always an excuse; EDHREC doesn’t get competitive EDH data, no one uses the site anymore (what does that even mean? ), it’s good in their deck so that means it’s a staple. If the person making the case for the card seems allergic to data and has two anecdotes for every data point you come up with, stay away. “Forced” or “bad” spikes have a familiar graph shape. A precipitous climb followed by a meteoric descent. 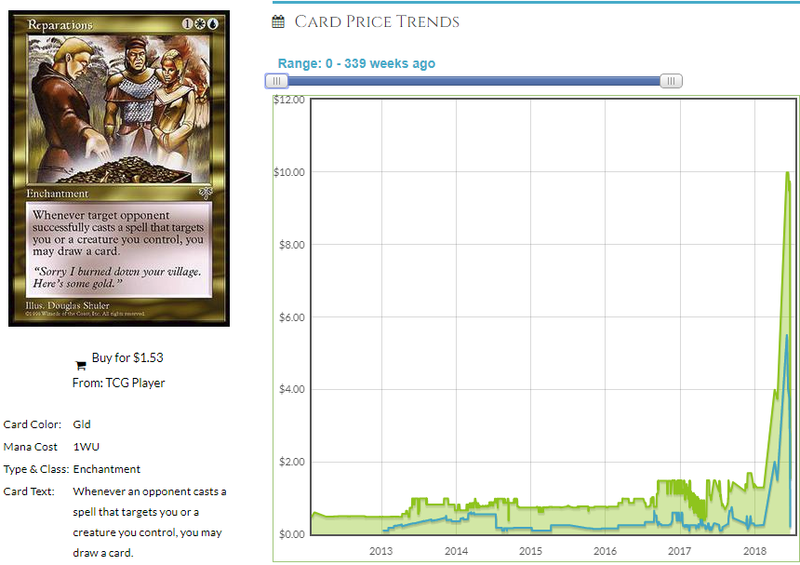 Usually the price ends up somewhere between where it started and where it peaked, but lately these dumb spikes haven’t panned out very well and the card goes back down to where it started – usually because the people behind the buyouts are used to being able to buy out TCG Player and letting everyone else think they’re geniuses for buying out Cardshark. So what characterizes a “good” spike? I think that a good one has two major components. I think the two characteristics of any good spike are sustainability and predictability. A good spike looks less like a spike and more like a plateau because the new price is agreed upon as the right price. This comes from organic demand. The card actually is an EDH staple, spiking as the result of a new deck being viable and not the result of dickery and wishful thinking. Notice how even though the price went down a bit, it went back up over time and the overall trend is in an upward direction? Do you think Reparations will trend in a similar manner? Hard to say – Reserved List cards have nothing pushing their price down per se besides a race to the bottom as dealers who sell by being the lowest available price leapfrog each other trying to be the first to sell their copies of a useless card off. 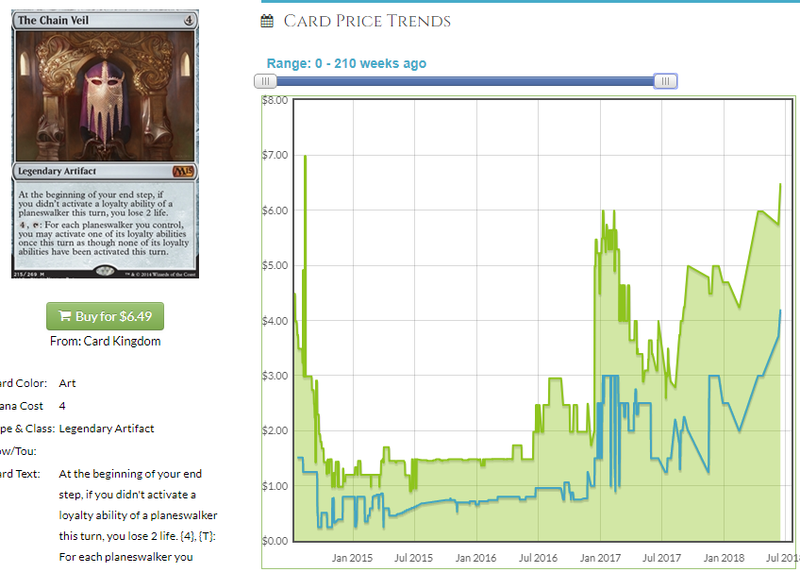 You didn’t have to dump your copies of The Chain Veil as soon as they spiked – you had time to try and get the best price and the card is now worth more than its initial spike price. In fact, current buylist is nearly at that amount. The sustainability of The Chain Veil is what makes it a “good” spike – Superfriends, Atraxa, the combo with Teferi and speculation that Commander 2018 will be Planeswalker-helmed decks because of one mention of the word “Planeswalker” in the Commander 2018 press release have all driven this card to where it is. Imagine that, a card that’s not even on the Reserved List going up in price! I didn’t even know we did those anymore. Commander 2018 is giving us another chance to shake our heads at Team Kittycat. Not all of their buys are as bad as Waiting in the Weeds but they are as obvious. 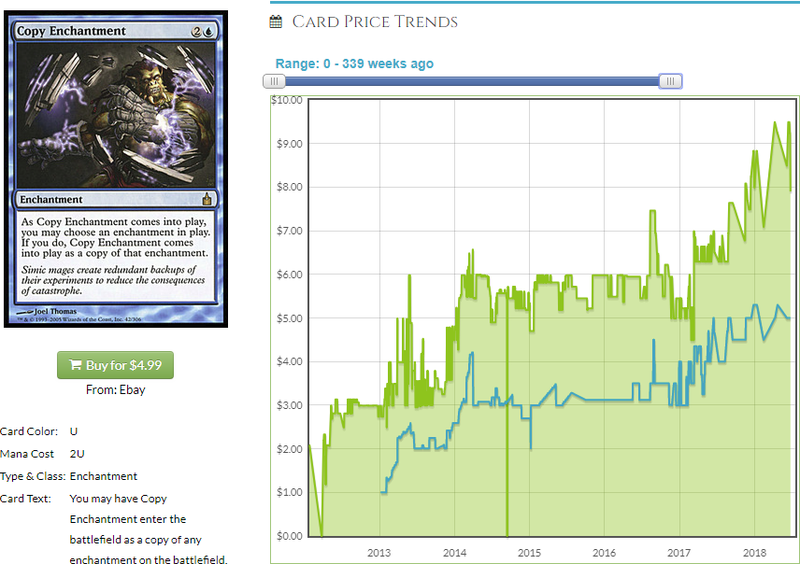 I don’t think Serra’s Sanctum is going to go back down from over $100, for example but that’s because it’s a Reserved List card, had some Legacy and EDH demand before (I called it at $30 when the Daxos deck was printed and that didn’t do much for its price although a few people made some money). Idyllic Tutor, though, seems like a bit of a Kittycat to me. It’s in quite a few decks on EDHREC, mostly Voltron decks, but its recent interest seems as much predicated on its text box containing the word “Enchantment” than on an understanding of the format. Remember, Waiting in the Weeds was a stupid buy because it was bought out before we even knew what the decks would be like and it turns out none of the 3 commanders really benefit all that much from having a bunch of cat tokens. I’m not saying an Enchantress deck won’t benefit from a tutor, it will, I’m saying anything else we buy at this juncture is purely speculative, may look stupid later and isn’t quite the slam dunk we think it is. I mean, unless you think one of the 3 commanders in C18 is going to be “sacrifice your enchantments” themed, Femeref Enchantress is probably a bad pickup or a kittycat if you will. An “obvious” spec that doesn’t actually work with the deck is a kittycat and I think we’re about to see some more kittycats go up. What Do We Like Instead? I’m glad I pretended you asked. I think there are some cards that haven’t gone up yet that could based on Commander 2018. We know it’s Bant Enchantress, so my approach for researching this was look at pages of cards rather than pages of commanders. I don’t know how much you use EDHREC, so I’m going to hold your hand a bit here if that’s OK. Since I already have Idyllic Tutor pulled up from checking how many decks it’s in, this is as good a place as any to start. Here’s the page I’m on. Its starts by giving us a list of Commanders and you can tell quite a bit about what kind of card Idyllic Tutor can be in EDH. Oloro decks use it, Uril decks use it and Zedruu decks use it. What are the odds Oloro decks are searching for Bear Umbra, Zedruu decks are searching for Phyrexian Arena or Uril decks are searching for Transcendence? The card is used for three different kinds of cards in those decks. Since we don’t know what any of the commanders do, it’s hard to know how we’ll use Idyllic Tutor but we can get a sense of what kinds of enchantments might be good with other Enchantments. This is where we weigh reprint risk versus power and make our decisions based on that. Scroll down more, past the top Commanders, New Cards and Reprinted Cards. “Signature Cards” is what we want. Not all of them pair with Idyllic Tutor well (Path to Exile? What?) but they are correlated in that a deck with Idyllic Tutor is very, very likely to run them also (like Path to Exile). Idyllic Tutor has the highest synergy with Idyllic Tutor, appearing in 100% of decks that contain Idyllic Tutor (lol, I’m sure the way to fix this is so hard it’s not worth it and will break every time they invent a new kind of commander like the “pair with” ones from Battlebond which broke the site’s code for a long time) but we see Enlightened Tutor which probably won’t get reprinted and goes in the same decks. 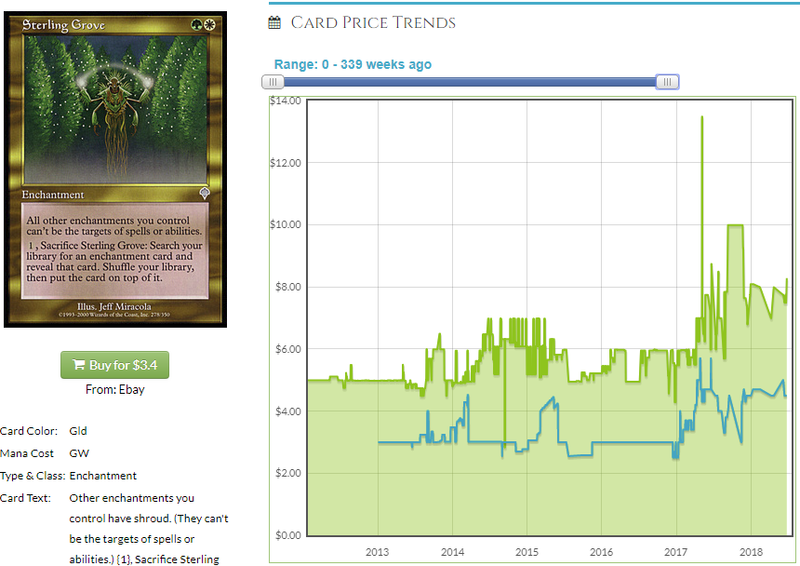 I bet Replenish isn’t reprinted and since it’s on the Reserved List it already went up – same as Academy Rector. Team obvious has already been through the list, starting as soon as they got the word about the archetypes. Sterling Grove, though, isn’t on the RL. Grove originally went up from a buck or two when it was announced that Theros would be enchantment-based. Grove didn’t really pan out as that good a pairing with… anything from Theros per se. It was vaguely good but Theros mostly made a lot of cards vaguely better rather than making one or two super good. 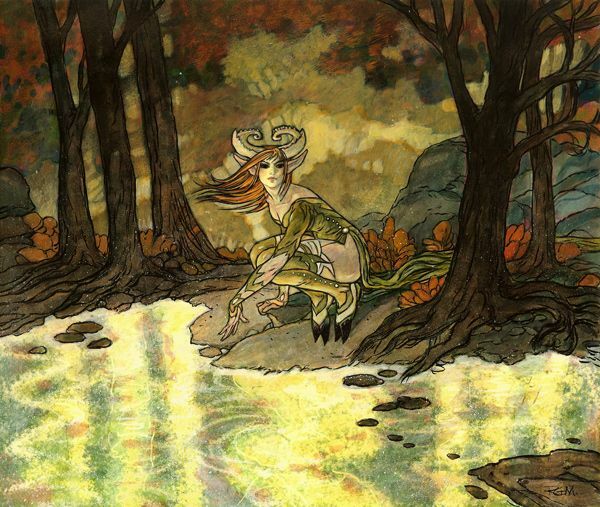 Grove is very useful in my current Bant Enchantress deck but I am trying to use data to make my evaluations rather than use anecdotes about my specific build. If this isn’t reprinted, it has a bunch of decks where it will be good. Whether you’re Voltron, Pillow fort or some weird hybrid (my deck uses Control Magic effects and the Enchantress triggers are to keep your hand full of answers), you’ll benefit from Grove and it hasn’t really moved much on the news but rather how good it is. Scroll down to the “Enchantments” section to see the Enchantments that are used most often in decks with Idyllic Tutor. This is another card that just shines in the deck. It’s a win condition, it nullifies some of their targeted removal (they have to deal with Greater Auramancy or Privileged Position before they can kill this and you just bring it back). I don’t know what else to say. If this isn’t in the deck, I bet it goes up. They don’t tend to put this sort of card in the precons which could mean it’s mostly insulated from reprint risk on the basis of me not seeing them reprint cards like Sculpting Steel in the artifact deck, for example. Mirage Mirror seems more likely to be reprinted, for example. This is a narrow card and if it’s not in Commander 2018, it basically never gets reprinted. If you do buy these and it’s in the precon, just double down and buy as many copies as you can at the new price until your average cost is down to a non-embarrassing amount and then every copy will go back up. This has great growth numbers and it’s not like a Bant Enchantress deck running around will hurt that. I still think you are safe and I think even though an $8+ buy-in is high, I think the ceiling is pretty high, too. I still get these in bulk, also, so that’s a thing – people don’t know this is a card so its growth has been sneaky and secret and if that doesn’t reflect sustainability, I don’t know what does. There are a few more pieces of higher-hanging fruit that Team Kittycat missed but I think my time next week will be better spent looking at one of the other 3 archetypes. Spoilers start Monday and that will give us a better idea of what we’re looking at. Until next time!